Marry knowing that it is for love and not money. This prenuptial agreement (also known as agreement to contract out Property (Relationships) Act 1976) allows you to plan how you will divide your current and future wealth between you and your husband, wife or partner should you decide to divorce or separate in the future. It will help you control your ownership of important assets such as your house, sentimental possessions and your business. A prenuptial agreement sets out how assets and liabilities will be divided if you separate permanently or if your marriage ends. Making a plan in advance should help you avoid expensive divorce settlements, help you keep items of sentimental value such as family heirlooms or property, and help you control who inherits your wealth. Many people consider planning for break-up unromantic shortly before a wedding or civil partnership. However, preparing a prenup emphasises that the reason for marriage is love and not money, and can give both people confidence about what will happen should the marriage fail. makes a separation less emotionally stressful by removing the need to negotiate over as many things. the lawyer must certify that, before that party signed the agreement, the lawyer explained to that party the effect and implications of the agreement. 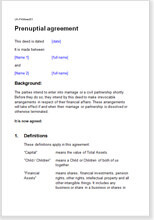 We also stock a simpler version of this document that has been written for couples who are likely each to be financially independent before the marriage or partnership and for whom the concern is about ensuring that wealth and assets remain in the possession of whichever one brought them in, should the marriage fail. We expect that this alternative document will be more suitable for older couples who have already accumulated wealth, and who perhaps are marrying for a second time. See Prenuptial agreement: protection of property. The Net Lawman pre-marital agreements have been written to help you to comply with the suggested legal requirements. This agreement covers a very wide range of possible outcomes and also deals with many matters to be agreed during your marriage. There is extensive coverage of property, possessions, investments. Children arrangements are covered broadly and shortly, because circumstances at divorce can be very different to those at marriage and a judge will make an order based on what he sees at the time. final statement of understanding of legal requirements.